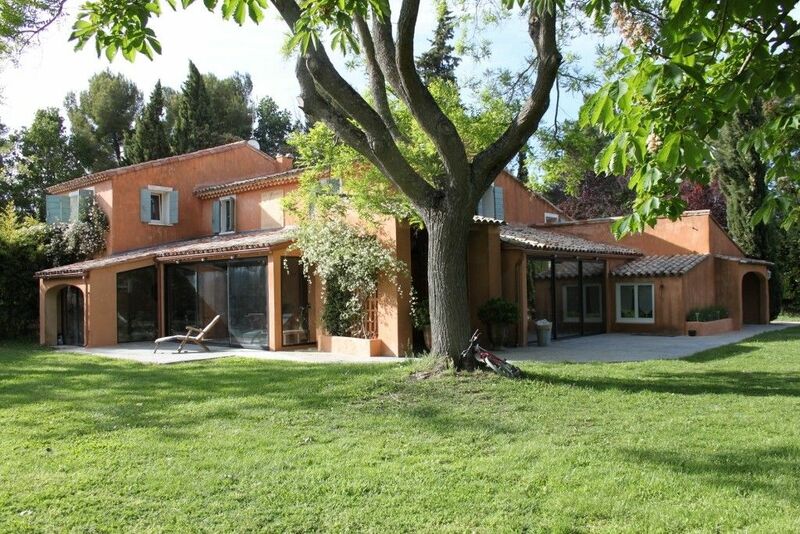 Style : Large villa, full of charm and well presented, set on vast enclosed grounds, of 10 hectares, 3 horses you can ride - Bbq - private tennis and 17 meters swimming pool - within easy reach of shops, 13 km north of Aix en Provence. The property on 10 hectares includes the farmhouse, a wooden cabin perched in a tree and a small house rented in the year non-visible Mas. Bedroom 3 : 9m2, first floor, terracotta floor, double bed. Bedroom 4 : 12m2, first floor, terracotta floor, double bed, desk. Views of pool. Bedroom 5 : 16m2, first floor, terracotta floor, queen size bed (160 x 200cm), chest of drawers, wardrobe, armchair. 2 windows, views of the pool. Shower room : 3m2, ground floor, en suite to bedroom 1, shower, washbasin. Bathroom Dressing room : first floor, 12m2, bath, 2 washbasins, heated towel rail. 2 Separate wcs : one on the ground floor with handbasin, the other on the first floor. Grounds : 10 hectares, fully enclosed, with landscaped garden, automatic watering and gate. Terrace 1 : 30m2, with views of garden and pool. Terrace 2 : 18m2, with views of garden and pool. Stone table and bench (sits 1012), teak outdoor furniture for 4, teak sunloungers. Pool : 17 x 5.5m, protected by alarm, ladder. Depth: 0.7 to 1.7m. Sunloungers, large parasols. Gazebo : 16m2, table and chairs (sits 810). Tennis : hard court. Nous avons passés un excellent séjour dans ce sublime Mas. Un havre de paix, dans la forêt et à la fois proche de tout, bien équipé, très confortable, superbe piscine, bbq, table de ping-pong et terrain de tennis. Situated in Saint Cannat, approx. 13 km from Aix en Provence, 25 km from the Lubéron Regional Park, 40 km from the Verdon Regional Park, 60 km from St Rémy de Provence and Avignon. Environment : Situated on vast and pretty enclosed grounds with trees, with a second villa right on the other side and a long let property, not visible from the villa but sharing access. les tarifs indiqués sont valables pour 12 personnes maximum.